The Lakers are losing games at almost the same rate they’re losing players. Jordan Farmar left with 6:33 remaining in the third quarter of the Lakers’ game Tuesday against the Milwaukee Bucks at Staples Center after experiencing tightness in his left hamstring. He won’t return and plans to receive an ultrasound on Wednesday. This marks yet another blow to the Lakers’ depleted roster, which already includes injuries to Kobe Bryant (fractured left knee), Steve Nash (nerve issues in back), Steve Blake (hyperextended right elbow), Xavier Henry (bone bruise in right knee) and Wesley Johnson (stomach flu). That leaves the Lakers with only one traditional point guard in Kendall Marshall, who was taken from the Developmental League only a week ago. Farmar has struggled ever since returning from a strained left hamstring that had sidelined him for 10 games. He finished with zero points on 0 pf 5 shooting, seven assists and four rebounds in 20 minutes in the Lakers’ game against Milwaukee. Through four games in his return, Farmar had averaged 6.75 points on a 27.7 percent clip and six assists in 26.25 minutes per game. Before his injury, Farmar had averaged a dependable 9.2 points and 4.4 assists in 18.9 minutes. 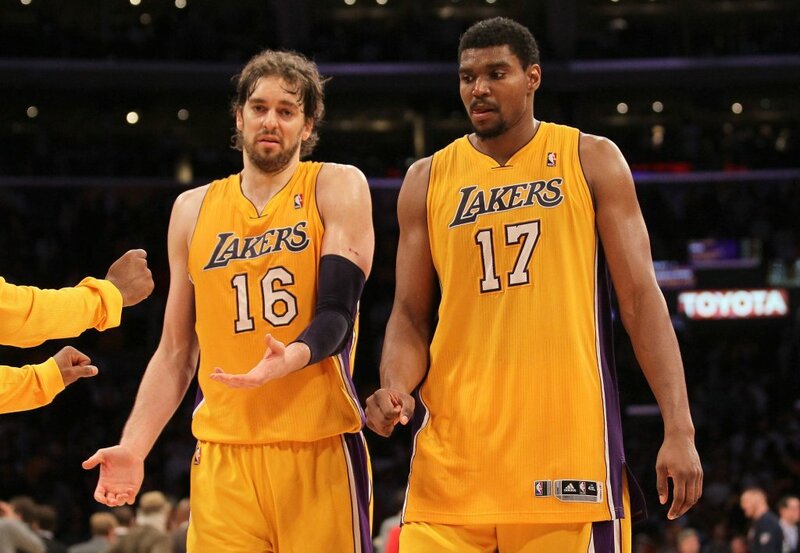 Pau Gasol and Andrew Bynum will forever be linked as Laker teammates. It’s unlikely they will be linked as centerpieces of a deal, however, that would involve Gasol going to the Cleveland Cavaliers and Bynum going to the Lakers. According to a league source familiar with the details, the Lakers wouldn’t accept such a proposal as reported by ESPN.com. One, the Lakers have no desire to bring back Bynum. His role in bringing two NBA championships with the Lakers was soured with behavior issues before ultimately being part of a four-team traded that brought Dwight Howard to the Lakers last season. Bynum was also indefinitely suspended by the Cavaliers for conduct detrimental to the team. Bynum has only averaged 8.4 points on 41.9 percent shooting and 5.3 rebounds in 20 minutes. Secondly, the Lakers aren’t keen on the deal even if it would involve immediately waiving Bynum. He would be owed $6 million of his $12.3 million salary if he is waived before Jan. 7. Cleveland has already paid Bynum around $4.828 million, leaving the Lakers to owe Bynum the remaining $1.72 million.Though the Lakers could ultimately save up to $20 million in payroll and luxury taxes, the Lakers would want more assets. Per NBA rules, the Cavaliers would have to include another player to make the deal work. Third, the Lakers are currently hoping Gasol will bounce back from a sub-par season where he has averaged only 14.7 points on a career-low 44.6 percent shooting. Gasol, who is making $19.3 million in the final year of his contract, is slated to play when the Lakers (13-18) host the Milwaukee Bucks (6-24) tonight at Staples Center after sitting three of the past five games because of an upper respiratory infection. The Lakers are decimated by injuries, including Kobe Bryant (fractured left knee), Steve Nash (nerve issues in back), Steve Blake (hyperextended right elbow) and Xavier Henry (bone bruise and tone cartilage in right knee). But the Lakers currently remain reluctant in writing this season off. In what will mark their 17th different starting lineup this season, the Lakers (13-18) will start Nick Young at small forward tonight against the Milwaukee Bucks (6-24) at Staples Center because of the strong likelihood Wesley Johnson sits out with gastroenteritis, otherwise known as the stomach flu. The Lakers are already reeling from long-term absences to Kobe Bryant (fractured left knee), Steve Nash (nerve issues in back) and Steve Blake (hyperextended right elbow). The Lakers also will reevaluate small forward Xavier Henry in 7-10 days after suffering torn cartilage and a bone bruise in his right knee. Young has become of the few bright spots for the Lakers’ this season, averaging 16.2 points on 42.9 percent shooting mostly as a bench reserve. But Young’s ascension to the starting lineup has less to do with his stellar play and more to do with Johnson’s illness. Through six starts, Young averaged 9.5 points per game on 33.5 percent shooting. Through 25 games off the bench, Young has averaged 17.8 points per game on a 44.3 percent clip. “We’ll look and see how it goes tonight,” Lakers coach Mike D’Antoni said. “You always evaluate it. But this move was caused by this. We’ll see what happens. Too many to count. It’s in the 50’s or 40’s. I don’t have a favorite one. They’re all my favorites. Most of them are about my family, kids, basketball, God and where I’m from. I got my first one when I was 16 with a basketball and my mom’s name on it that says “In Loving Memory. Doing it for You.” I then waited before I got more. I didn’t have a lot of money. So I started doing a little extra. I got them in high school sporadically. Once I got in the NBA, I got some every week. With an MRI showing a bone bruise and cartilage damage in his right knee, Lakers forward Xavier Henry will be sidelined for the next seven to 10 days. The Lakers’ initial timeline means Henry is slated to miss at least the next three games at Staples Center against Milwaukee (Tuesday), Utah (Friday) and Denver (Friday). It’s currently unclear if Henry could return in time for the Lakers’ two-game trip next week in Dallas (Jan. 7) and Houston (Jan. 8). The Lakers will reevaluate him around that time frame, making it possible Henry could miss even more time. Pau Gasol has healed his upper respiratory infection enough to feel comfortable playing Tuesday against Utah. But the Lakers also remain hobbled by other injuries, including Kobe Bryant (fractured left knee), Steve Nash (nerve issues in back) and Steve Blake (hyperextended right elbow). Lakers center Chris Kaman also missed practice on Monday because of sprained left ankle, though he is expected to play Tuesday vs. Milwaukee. Long after everyone else cleared the practice court, Pau Gasol remained there working on post moves, mid-range jumpers and conditioning drills. Once it was all done, Gasol stuck his head into a trash can and coughed out the built up mucus stemmed from a upper respiratory infection that kept him out of three of the past five games. 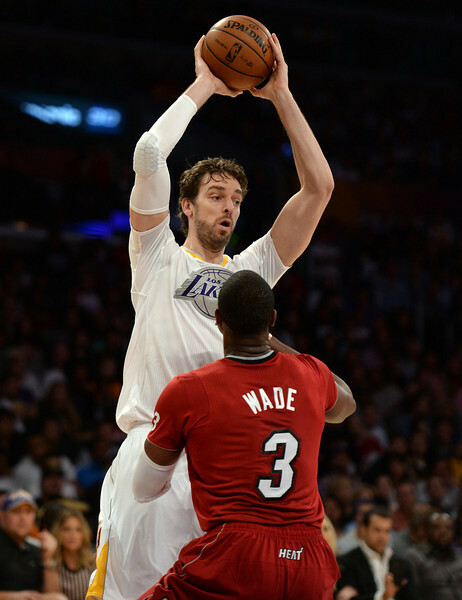 Gasol will suit up when the Lakers (13-18) host the Milwaukee Bucks (6-24) Tuesday at Staples Center. But the image revealed two things. It aimed to contradict the notion that Gasol was using his season-long ailments as an excuse either to sit out or not play with full effort. It also caused some team officials to roll their eyes at the apparent theatre before Gasol spoke to reporters. Whatever the case may be, Gasol sounded both determined to play through his latest ailments and unapologetic for sitting out earlier. Once it became official, Kobe Bryant jumped up in the air and flailed his arms. The grumpy personality Bryant usually displayed suddenly evaporated. And he couldn’t stop smiling. Xavier Henry calmly sat by his locker, bearing the same laid-back expression and tone that he does after posting a a breakout performance. Yet, these circumstances were different. Henry had strained his right knee in the first quarter of the Lakers’ 111-104 loss Sunday to the Philadelphia 76ers at Staples Center. Henry will take an MRI on Monday after describing the knee as “a little swollen.” And the Lakers offered no evidence they will snap their five-game losing streak anytime soon. But Henry still maintained optimistic everything would work out. Why? As if the Lakers could afford any more injuries. Lakers forward Xavier Henry strained his right knee early in the Lakers’ game Sunday against the Philadelphia 76ers at Staples Center, and will have an MRI on Monday morning. Henry left the game with 1:14 remaining in the first quarter and went scoreless on two field goal attempts in five minutes. It remains to be seen how serious Henry’s injury will become. But with the pain in his knee keeping him out at least for the rest of the Lakers-Sixers game, it exposes the team’s already flimsy backcourt. The Lakers are still nursing injuries to Kobe Bryant (fractured left knee), Steve Nash (nerve issues in back) and Steve Blake (hyperextended right elbow). Lakers backup guard Jordan Farmar played in the past three games after missing the previous 10 contests because of a strained left hamstring. But the Lakers relied heavily on Xavier Henry as the team’s backup point guard because of D’Antoni feeling uncomfortable with Kendall Marshall, whom the Lakers’ recently acquired from the Development League. But with the Lakers’ roster dwindling by the day, D’Antoni may have no other choice. 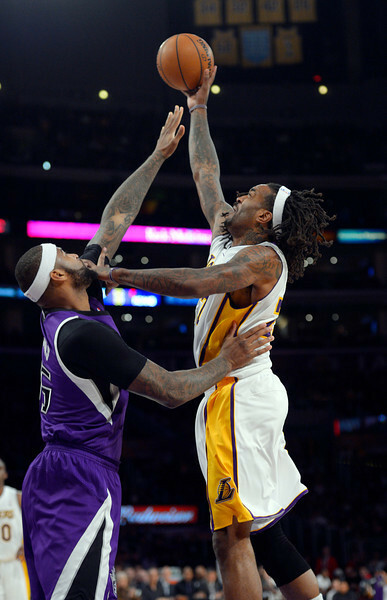 Jordan Hill will start at center when the Lakers (13-17) host the Philadelphia 76ers (8-21) tonight at Staples Center. Pau Gasol will miss his third game in the past five contests because of an upper respiratory infection, while Chris Kaman will come off the bench after sprained his left ankle in the Lakers’ loss Friday to Utah. Hill has started in 16 games, averaging 10.8 points on 56.8 percent shooting and 8.5 rebounds in 23.8 minutes. But Lakers coach Mike D’Antoni has preferred playing Hill off the bench out of concern that he burns out with fatigue. If not for Kaman just coming off an ankle injury, he would have started. Against Utah, Kaman posted 17 points and 10 rebounds. But D’Antoni said Kaman will come off the bench ahead of Robert Sacre both so he can get in a rhythm off his tender ankle and because of Gasol’s absence.